Aquaglide Amundson Stand Up Paddle Board: 11' 3"
Aquaglide has teamed up with John Amundson, to bring his custom shapes into production for all to enjoy. John has been living on the North Shore of Oahu for 20 years, shaping and building surfboards, kite boards, and paddleboards. He is on the water daily, and gathers input from a wide range of enthusiasts to come up with designs that are easy to ride, but favored by the top paddlers on the island. 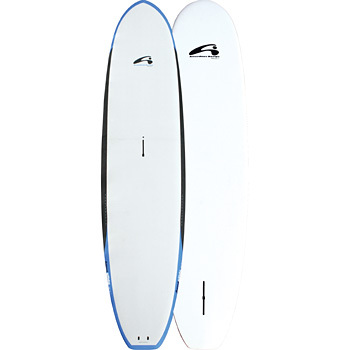 The Amundson 11 3 is designed to be a versatile shape that is suitable for the first time paddler, as well as more experienced riders who are looking for a board that can used in flat-water or surf. John was able to achieve this when he discovered that a board s stability comes primarily from length and width, not thickness or volume. So he made this board 29 ½ wide so that anyone can start out on it in flat-water. For surf conditions, he thinned out the rails and gave it a modified longboard rocker, so it reacts quickly and holds an edge. Durability was also a top priority, so this board features a Duratec bottom sheet, which is basically a very thin layer of ASA plastic that is laminated to the bottom to prevent dings and scratches. This layer does not add weight, because it replaces the final hot-coat or paint. 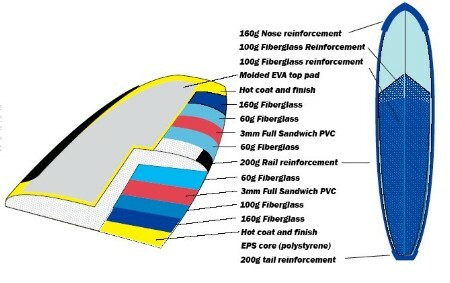 Then the top is covered with an integrated EVA deck pad that runs from nose to tail, for traction and comfort. No waxing required. An added benefit of the thin shape is that less material is used, so the boards come out lighter than thicker designs. The 11 3 averages 27 pounds. A fin-box is mounted in the middle of the deck to attach a windsurf rig. The size and stability make it a great board for learning to windsurf, and experienced windsurfers also love it because it brings back the early days of simply getting on the water in all conditions, without all the specialized gear. This deck box can also be fitted with a webbing strap for use as a carry handle.